Know as fashion’s most comprehensive collection of women’s apparel, accessories and footwear, WWDMAGIC showcases more than 2,000 emerging to established labels across every pricepoint and trend. Presented in collaboration with Women’s Wear Daily, WWDMAGIC features expert fashion forecasts, exclusive networking events, cutting-edge seminars and all the styles of the season. Phoenix Fashion Week travels to Las Vegas every season looking for the next “it” designers as a part of the 12-City Designer Tour. It’s always great to see friendly faces among the 1,000’s of vendors setup each day, and we happened to spot one such stylish local, fashion blogger Esmirna Tapia of Platforms for Breakfast. Whether you are a fashion blogger looking to network, a fashionista that shops local or you just want to stay on-top of the latest trends, the upcoming Bri Seeley x Indie Stitch event at Clothes Minded is a must! 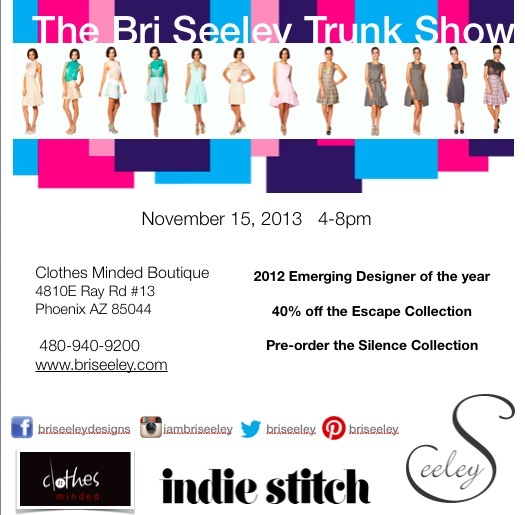 Join Bri Seeley, Phoenix Fashion Week’s 2012 Designer of the Year, for an exclusive shopping event at popular Ahwatukee Foothills boutique Clothes Minded! Clothes Minded owner Kim Kendall is passionate about supporting local designers (many of them connected with Phoenix Fashion Week!) and is striving to build awareness about the fact that “designer” clothing doesn’t have to cost a fortune. “I am hosting this event to not only support Bri Seeley, but support the blogger community because they’re becoming a huge influence in the industry…every brand today should have a blog!” Kendall said. Shop her award winning Escape Collection at 40% off, and pre-order her newest Silence Collection that debuted on the Phoenix Fashion Week runway last month! “I’m very excited to be returning to Phoenix. The community has been so remarkably supportive of my brand since winning Designer of the Year. An event like this, and the partnerships with Phoenix Fashion Week, Clothes Minded, and Indie Stitch give me an opportunity to connect with my customers on a more personal level,” Seeley said. Bri Seeley has also partnered with well-known local blogger Dustin Hoyman of Indie Stitch to activate the talented crop of bloggers here in Arizona. “Bloggers are becoming increasingly important to fashion. While a singular blog might not have the impact of a large publication, a strong blogging community can provide the voice and excitement to be the catalyst for change. We’re now seeing new trends and styles emerge from the blogosphere with viral speed. Indie Stitch wants to help build and grow our fashion community through creating real life connections between bloggers. The larger and more connected our community, the easier it is to attract designers and brands to our town, thus helping to grow our scene,” Hoyman said. The 2013 Phoenix Fashion Week Log In Lounge will be hosted by Cabana Apartment Homes, which means it will be more colorful and stylish than ever before. Known for their daring color schemes and unique retro-vibes, Cabana will bring their style and creativity to the Log In Lounge. Now a staple of all Phoenix Fashion Week events, this year’s Log In Lounge will be larger than ever before offering ample seating and pristine runway views in addition to serving as hub of activity, pampering and swag for bloggers and media. “The evolution of the Cabana brand design features are strongly influenced by international fashion trends and national and local art and design,” said Cabana Modern Apartment Homes Partner Pat Watts. “Such diverse influences as runway shows in New York and Milan, art installations in Phoenix and San Francisco, vintage fabrics, textures and designs have worked their way into the Cabana design aesthetic. Taking international influences and marrying them to local inspirations has resulted in the unique Cabana look,” she said. “Partnering with Phoenix Fashion Week is a natural fit for the Cabana brand as fashion continues to be a major inspiration for the aesthetic of each of our apartment properties,” Watts said. The Cabana Log in Lounge offers media, bloggers and designers a place to connect and recharge themselves and their gadgets. Besides serving as a spot to mix and mingle with other bloggers and media, the Cabana Log In Lounge is the Official Host Location for interviews with the designers of Phoenix Fashion Week. The tech hub is designed to operate as an onsite newsroom with charging stations for electronic devices in a prime end-of-the-runway location. Created to be the ultimate media ‘swag suite’, the Cabana Log inLounge will be stocked with snacks, beverages, product samples, gift bags and will also offer complimentary mini-manicures and a braid bar to provide onsite beauty-touch ups in between frenetic note-taking, interviews, story editing, Instagramming, Tweeting and Status Updating. “As one of the most fashion-forward rental properties in the Southwest, we are thrilled the Cabana brand is bringing its stylish vision to Phoenix Fashion Week,” said Brian Hill, Executive Director for Phoenix Fashion Week. “When walking into any of the Cabana Modern Apartment Homes, it’s obvious how fashion is seamlessly infused into their design, from bright pops of color to quirky vintage touches,” he said. This year’s high-tech Cabana Log In Lounge will be styled by the company’s award-winning interior design team, Private Label International and outfitted with furnishings from each of the properties. Styled like their funky apartment homes, this space will provide the ultimate place to relax, recharge and connect with others. Cabana’s unique approach to decorating will not only create a relaxing environment but also one full of color and life for anyone craving a little inspiration. Meet Ashley LeMieux, a 26 year old local entrepreneur living in Phoenix. After teaching at an inner city high school as an internship, she knew she needed to do something for the at-risk youth that she grew to love so much. Ashley started a non profit organization, The Shine Scholarship Project, which raises money to send at risk youth to their first year of college. 8 months ago, she knew she needed to still do more, so she launched a for-profit business called Threads by The Shine Project. This business employs the kids to make fashionable and trendy bracelets so they can pay their way through college and learn important business skills to be successful in life. They have changed Ashley’s life in every way. Inspired yet? Thought so. In fact, after meeting her for the first time, Phoenix Fashion Week was seriously inspired by this young blogger/entrepreneur and knew we had to be involved. One of Phoenix Fashion Week’s main pillars is Humanity, and we are excited to announce that we have partnered with Ashley and The Shine Scholarship Project to host her upcoming Beauty Bar Charity Event, along with various blogging and social media classes within her Seminar Series at The Fashion Hub! I had the amazing opportunity to speak with Ashley via email to learn more about her style, blog and exciting ways you can see The Shine Project in action! What is the main takeaway/message from a first-time visitor of your blog? How have your past experiences inspired you to give back your time to others and brought about your passion for supporting youth and speaking to your peers? With having accomplished so much at a young age, how do you think others your age or younger can make a difference in their own community? You hosted an almost pop-up shop of sorts at our MIM event, why did you feel this event was the perfect fit for your sister brand, THREADS? Tell us about your upcoming Beauty Bar event, how will this directly benefit your youth scholarship program? *We love our readers! Comment below with why you feel you could benefit from Ashley’s upcoming seminar series and we will choose a random reader to WIN A SEAT IN ONE OF SHINE PROJECT’S CLASSES! 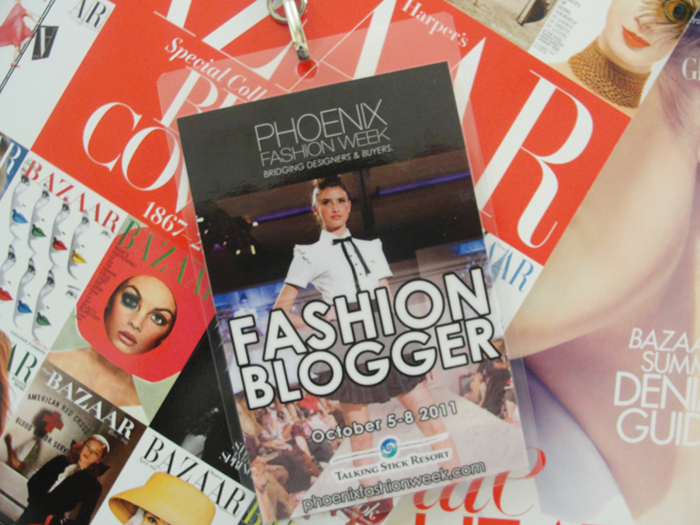 Phoenix Fashion Week is incredibly appreciative of our local blogging community. Arizona fashion bloggers are talented, chic and know what’s fashionable. That’s why last year, for the first time, PHXFW debuted our Login Lounge, presented by YELP, to provide local bloggers and media a hub for all their ferocious blogging and interviewing activity to take place. This year, the Login Lounge is back and it’s bigger and better than ever, literally! Phoenix Fashion Week Media Director has been hard at work this year making the lounge as “blogger heaven” esque as possible. Of course, working with a wonderful partner helps too. Yelp has believed in PHXFW’s vision from day one and is collaborating ideas to make the Login Lounge a go-to spot for bloggers during fashion week. Whether you want to interview a designer, catch up on some networking, snag some swag, primp your nails or recharge your important blogging devices, the Yelp Login Lounge is sure to pleasantly surprise you. In fact, it’s new location at the end of the runway ensures a great view and photo opportunities for any bloggers wanting to stay in the chic destination. “Yelp is so excited to be a part of the 2012 Phoenix Fashion Week by hosting Yelp’s Log-In Lounge! We encourage attending fashionistas to check into Phoenix Fashion Week using their Yelp mobile app to enjoy yelpy benefits including a charging station, hand massages by Massage Envy and express manicures by Teres!” said Yelp Senior Community Manager Lindsey Fosse. PHXFW is only days away, and we cannot be more thrilled to reveal the revamped and chic-ified Yelp Login Lounge! If you are a fashion blogger or media professional, make sure to stop by and get your blog on! Remember to tweet it out on Twitter using hashtags: #phxfashionweek #phxfw and #loginlounge. If you’re anything like us at PHXFW, you spend a countless amount of time following and reading your favorite fashion blogs. From The Man Repeller to Tea Talk, the World Wide Web has helped to bridge the gap between fashionistas everywhere. Why not join the fashion blogosphere yourself? With a little persistence and a lot of creativity, you could become the next Leandra Medine, one post at a time. First things first: it’s all in the name. Choosing a moniker for your new brainchild is a major and probably the second most important element to starting your own blog. Not only will it make a statement about who you are, it will also be the thing that sticks—or fails to stick—in a reader’s head. Once you’ve figured out a name, it’s time to figure out where you’d like it to be hosted. Popular blog hosts like Tumblr.com and WordPress.com have easy-to-use interfaces and plenty of customizable features to help give your blog the perfect look. If you’re willing to dish out a couple of dollars, you can have your own original domain name sans their copyrighted stamps. Speaking of originality, figure out how you want your blog’s overall appearance to be. Do you want to go minimal with black and white or are you the more of the colorful and eccentric type? For color combo inspirations, check out kuler.adobe.com. If you’re familiar with Photoshop or other graphic design software, try putting together a banner that culminates what you and your blog are all about. When you’ve gotten all of that figured out, the fun part begins with the actual blogging. First, what kinds of topics do you want to cover? Celebrity or street style? Personal outfits of the day? If you’re into a little bit of everything, consider designating different days of the weeks for certain topics and be sure to use consistent tags to help archive everything into one place. The next step is the easiest: Blog! Don’t forget to add photos that’ll make each post that much more interesting. Finally, the most important part for starting your own successful blog is sharing it. Urge all of your Facebook friends to check it out, tweet a link to all your followers, call Grandma and tell her about it. No matter how you share it, a friend will tell a friend (or a fellow tweeter). Remember that popularity isn’t everything, though. If your blog isn’t blasting off into the blogosphere like you wish it would, stay patient and keep producing great content out of your passion for fashion. Just as that one cliché goes, a fashion blog is what you make it, and you have the keyboard to create whatever you want. Have your own blog or a favorite one you follow? Share it with PHXFW!